Vatican - President Mahmoud Abbas met on Monday with Pope Francis I in the Vatican during which President Abbas briefed the Pope on the latest developments in Palestine and the implications of the US decision recognizing Jerusalem as Israel’s capital and moving its embassy to the city. 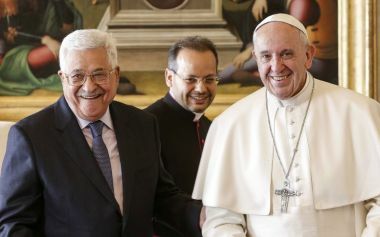 The meeting also revolved on relations between Palestine and the Papal seat and the strong historical relations between them, while President Abbas thanked the Pope for his support of the just Palestinian cause. President Abbas arrived in Rome on Sunday night on an official visit. He is scheduled to meet on Monday with the Italian president and his prime minister.